New York, I feel your pain. You’re hemorrhaging under the weight of your artistic success and accomplishments, bleeding out talent like Jackson Pollock after the car crash. I know it’s hard to keep all your children around while the rents keep rising and the scene gets hyped into the next century while it struggles to hold on to what it had in the last. Times are tough! If it makes you feel any better, times have been tough for arts professionals in Louisiana ever since John James Audubon drew his last bird (except for our “Blue Dog” guy, George Rodrigue, who somehow makes bank). Since then, we Louisianians have been busy concentrating on our music. So it’s been exciting and surprising to see the visual arts in Louisiana get a much-needed infusion of new talent from your old artopia. By all accounts, they’ve been lured to Louisiana, and particularly to New Orleans, by a siren’s song of cheap rents, cheap thrills, and the irresistible urge to court their muse in a new environment that needed to be built up from its foundation. We artists also like our dark places, so where better to court death than Post-Katrina New Orleans? The mix of Yankee art professionals with our native Creole varieties has been positively combustible, kind of like when the great European artists and art professionals started mingling with your people in the post-WWII period. One of the first sparks to light the fire was the arrival of curator Dan Cameron. He likes our Jazz Fest, started the Prospect New Orleans biennial and helmed the New Orleans Contemporary Arts Center for a while. And then the Mack Attack happened. In the fall of 2010, Amy Mackie, former curatorial associate of the New Museum in New York, was named the new Director of Visual Arts for the New Orleans Contemporary Arts Center. 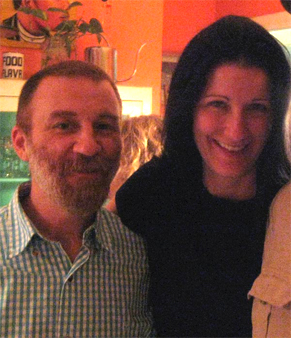 Right on the heels of Mackie trying on her directorial shoes, she was asked by Lafayette, LA’s Acadiana Center for the Arts curator Brian Guidry to jury the Southern Open 2011, an annual exhibition of the newest and best art from the Gulf Coast region. Mackie did her jury duty, and the verdict from this art critic is that this year’s Open is the best one yet. Much of this is also due to the caliber of artwork entered into the exhibition from New Orleans artists. All three of the top prizes went to New Orleans artists, yet I was unfamiliar with all but one of them. The Grand Prize, which included $1000 and the opportunity to mount a solo exhibition in conjunction with next year’s open, went to artist Luba Zygarewicz. She offered two installations. One was a stunning, sculptural tower of dryer lint complete with tags denoting the dates in which the lint was collected from her family’s dryer over the course of 12 years of laundry duty. 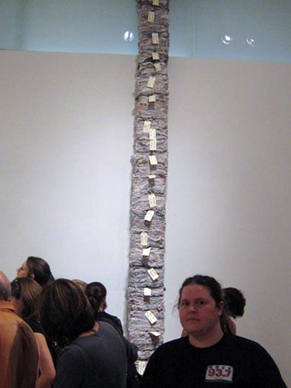 The other piece Zygarewicz offered was a wall of tags on which she presented single calligraphic letters and poetic reflections about her day to day life (some of which referred to her fight with cancer) that featured words that began with the letters presented on the tags. Zygarewicz’s installations were both conceptually rigorous and profoundly sublime pieces of art about time, mortality, perseverance, ingenuity and devotion to one’s family. The other prize winners were Andy Cook and Monica Zeringue (the one name which was familiar to me) who both received honorable mentions and $600 a piece. 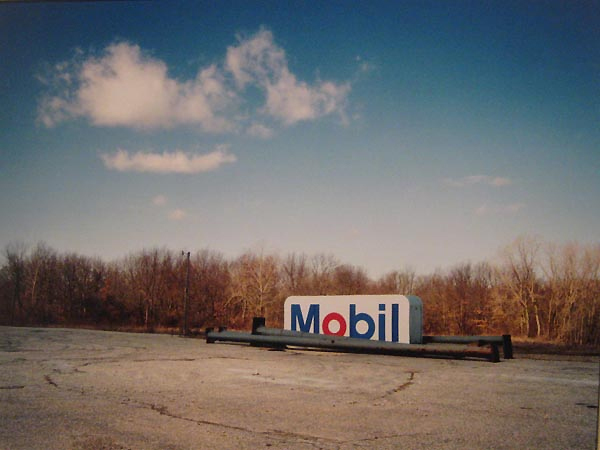 Cook is a photographer of the lonely and, at times, empty or derelict expanses of the American landscape. His colored photographs fall right in line with the current vogue for such things in our national search for an identity in the midst hard economic realities. The work is good, but I didn’t think that it was exceptional enough to lace in the exhibition. Zeringue on the other hand deserved her place, even though I preferred other works to be mentioned below. 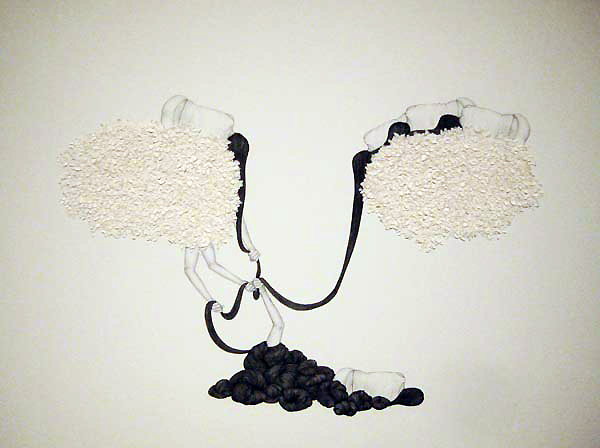 Zeringue creates graphite drawings of her pubescent self multiplying across virginal, white pages like a cross between a Hindu goddess and the little demon girl from the horror movie “The Ring.” Depictions of her hair play a big role in these drawings — pooling, entangling, spurting, engulfing and running amok on its own terms. Zeringue’s drawings explore the formation of her own sense of identity, and by extrapolation that of women in general. They are about “becoming” as signified by the presence of all that hair, which is a classic symbol of self, vanity and vitality. That’s the official top of the heap for the Southern Open 2011. In the second part of this article later this week, I’ll discuss the rest of the New Orleans artists that Mackie selected for the exhibition (including another New York City ex-pat). Stay tuned. The Southern Open 2011 at the Acadiana Center for the Arts (101 W. Vermillion Street, Lafayetter, Louisiana) took place from May 14 until July 9.